Brackley need to win their three remaining games if they are to keep their promotion hopes alive. 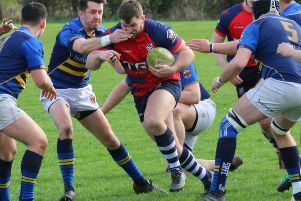 Saturday’s narrow 25-22 defeat at Midlands Four East South promotion rivals Northampton Mens Own means Brackley must bounce back against Sileby this weekend. With only two points separating the teams going into the match, it was always going to be a close game. The hosts started on top with their strong running and ability to slow down any ball Brackley got. Northampton soon capitalised on their possession to go over the game’s first try. When they did have the ball Brackley at times look dangerous but they made costly errors just as they looked like they might score. The visitors forced the hosts to give away a penalty which fly half Mike Lowdell slotted over. As the first half wore on, Brackley got frustrated with decisions not going their way, giving Northampton possession and the slight territory advantage. The hosts scored through a well-executed backs move off a line-out. Then on the stroke of halftime, Brackley conceded a penalty and dissent led to them being marched back 20 metres allowing the hosts to extend their lead. Northampton took more control in the second half, putting constant pressure on the Brackley defence. Several errors gave the hosts excellent field position which they took advantage off, scoring in the corner. That was followed with another try to make it 25-3 but Brackley started taking it to Northampton through the middle. Replacement Jonny Morris powered his way over from close range to narrow the gap. Brackley utilised the pick-and-go to put pressure on the hosts’ try line, which they eventually crossed as skipper Luke Hallam-Evans reached out to score. Brackley knew they need two scores to win the game and battered away at a desperate Northampton defence. Hallam-Evans looked to have scored again but the referee awarded a penalty try as well as giving Brackley a penalty to restart on the halfway line. With no time left on the clock and Northampton giving away another penalty in front of the posts, the visitors went for the win. But a metre away from the try line, the referee gave another controversial penalty, this time in favour of the hosts who kicked the ball out to seal a victory.